At Viacom, creative exploration is multifaceted. The Viacom Lab is a state-of-the art endeavor that utilizes virtual reality, GIFs, live streaming and immersive experiences to up engagement and the fan experience. But Viacom isn’t just on the cutting edge of technology. Manhattan HQ is redefining the aesthetics of the workplace with the Art at Viacom project. Started in 2014 as an initiative to highlight emerging, boundary-pushing artists who construct site-specific art installations. Led by Susan Claxton and Cheryl Family, the program has a serious charge: to create transformative experiences for Viacom’s clients, partners, employees and the public. It all begins in the vast lobby of 1515 Broadway, which boasts art both provocative and whimsical. Claxton and Family discussed why the medium is the message. What is your charge to artists? We encourage the artists to immerse themselves in Viacom’s culture: Where we work, how we work and how creativity drives everything we do. It’s more than just creating a piece for the space. The artists engage with employees and other passers-by, who watch them in action and talk to them about their process. We also host moderated conversations and hands-on workshops with the artists. How extensive is the project throughout the company? All employees have access to the program. In some cases, like our Rebecca Louise Law exhibit, hundreds of volunteers helped to produce the finished work. We always acquire works for our permanent collection, so the art can travel to different Viacom offices around the world. We have a tumblr (artatviacom.tumblr.com) and an Instagram feed (@artatviacom) that feature different artists on a regular basis, including employees and fan artists. What is the aesthetic criteria? Artists who are doing interesting work in a variety of media. The filter: whether it will surprise and inspire those who experience it. The goal is work that can transform the physical space and, given its large size, make an impact. Something unexpected. Crystal Wagner, for example, worked in chicken wire and plastic tablecloths. We’re never prescriptive with the artists – we want to showcase each vision. It’s inspirational. Art inspires from the outside in. We want to keep the installations alive even after they’ve come down, so we’ve created a poster and postcard series for people to put their favorites on display in their workspace. Where do you find the art? Literally everywhere. It’s the joy of discovery. We visit Art Basel in Miami each year, we look at social platforms, visit art shows and galleries in New York. Employees are making recommendations all the time. Sometimes, it’s an artist that worked with one of our brands. 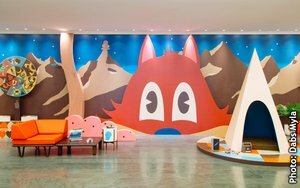 For example, Dabs Myla designed last year’s MTV Movie Awards set, and then we built a relationship with them around Art at Viacom. How often is art changed? We do major lobby installations about once a quarter. We are in the process of commissioning some smaller pieces to put on display in other areas of the building. Our tumblr and Instagram feeds are updated several times a week. As part of the installations, we always acquire pieces for Viacom’s permanent art collection, which includes Richard Serra, Robert Raushenberg, Nan Goldin and Andy Warhol. These can hang in different public spaces, or, if an executive has a particular affinity for the artist, it can be on loan in their workspace. What has been the public/employee reaction to the art? Fantastic! Our conversations with the artists for employees “sell out” and hundreds of employees watch the stream online if they can’t attend in person. We get a ton of positive feedback, and it leads to more people wanting to be a part of the Art at Viacom program, which is amazing. We’ve also had a lot of attention from the art world press.